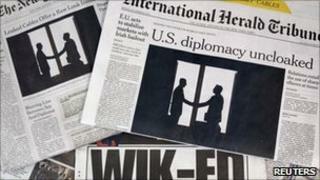 More than 250,000 cables sent by US embassies have been revealed by the Wikileaks website. They include reports of some Arab leaders urging the US to attack Iran and end its nuclear weapons programme. In another cable, the US Secretary of State Hillary Clinton instructs diplomats to collect personal data about key officials at the UN. Other lighter-hearted revelations range from the Moscow embassy describing Russian President Dmitry Medvedev as playing Robin to Prime Minister Vladimir Putin's Batman to the Tripoli embassy saying Colonel Muammar Gaddafi "relies heavily" on his Ukrainian nurse, a "voluptuous blonde". Here is a selection of comments from world leaders and officials in response to the Wikileaks revelations, with the source afterwards in brackets. "Such disclosures put at risk our diplomats, intelligence professionals and people around the world who come to the United States for assistance in promoting democracy and open government. "By its very nature, field reporting to Washington is candid and often incomplete information. It is not an expression of policy, nor does it always shape final policy decisions. The senior Republican on the House Intelligence Committee called the release very damaging to US interests. "The catastrophic issue here is just a breakdown in trust," he said. "For the first time in modern history, there is not an inconsequential agreement in Europe and in the region - in Israel and countries in the region - that the main threat stems from Iran, its plans to expand, and its plans to arm itself. "The documents that they released are a mischief. We do not see any value in them. This act is worthless," he said at a news conference broadcast live on state TV. "These documents are prepared and released by the US government in a planned manner and in pursuance of an aim. It is part of an intelligence warfare and will not have their desired political impact. Official Saudi government spokesmen were not immediately available but a Saudi government adviser who asked not to be identified said that the leaks were "very negative". The "extremely negative reports" of Pakistan-Saudi relations attributed to Wikileaks were "misleading and contrary to facts". "We work very closely with the US and we will continue to do so."